For high-fidelity sound, reliable service and seamless technology integration in a phone system, think Interlink! If your phone system is inadequate or problematic, it’s time for a change. Swap your old equipment for a new Voice Over IP (VoIP) / digital phone system that comes with the latest features and fits today’s fast-paced, mobile business. Your calls will come in loud and clear when you invest in a VoIP / digital system that transmits sound and video over the Internet. It offers many advantages over its analog/TDM PBX counterparts. Long-distance calls are free, other than the cost of Internet access. You can easily add, move, or change phone extensions and locations. Your employees can use your communications system and access your data network wirelessly, enabling them to stay in touch and be productive from home or on the road. They can also collaborate through voice, video chat, web conference and instant messaging, creating a seamless business environment anywhere they happen to be. Interlink Telecommunications will evaluate your communication needs and design a custom solution with the capabilities you want. We’ll integrate your new system with your existing infrastructure, applications and technology. An investment in a VoIP / digital phone system is a cost-effective move toward future-proofing your business communications. Design a VoIP / digital phone system that increases the effectiveness and productivity of your workforce while reducing your overall infrastructure costs now and in the future. We support all NEC phone systems as well as legacy systems by Nortel. Our field-experienced technicians are experts in troubleshooting. The right training and equipment allow us to quickly locate, identify and remedy problems. We offer FREE estimates. Contact us today to schedule a no-cost, no-obligation, onsite consultation to discuss your VoIP / digital telephone system needs. 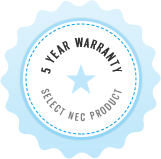 As a preferred supplier of NEC products, Interlink Telecommunications is able to offer the best-in-industry warranty. We guarantee to repair or replace defective products free of charge for up to 5 years after installation.